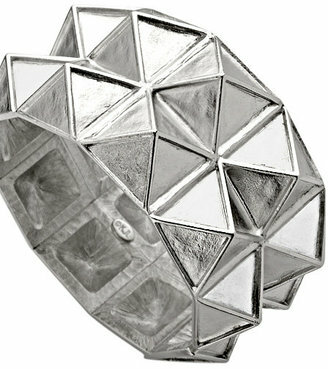 Kenneth Jay Lane's Double Pyramid Cuff is available in gold or silver for $99 at Max & Chloe. I actually have this cuff in gold which I bought months ago on sale at Gilt.com and it looks amazing - definitely an outfit maker! However, the clasp sometimes pinches me and it's so big, you have to remove it whenever you're putting on a jacket or coat. Guess that's true of all statement cuffs, though. 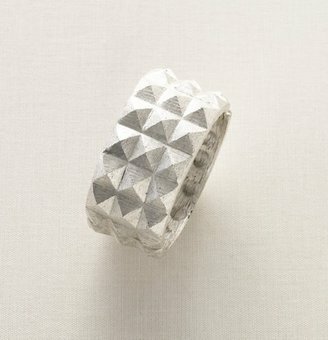 Get the look for less with this 3-row pyramid cuff in silver from LOFT, just $34.50. H&M will launch its third Fashion Against AIDS collection, available May 20 in stores and once again supporting youth HIV / AIDS awareness and education. For the first time ever, the Fashion Against AIDS collection offers guys and girls "festival themed" items that encompass the entire festival experience – from clothing and accessories to tents and sleeping bags. Wet n Wild sent me a couple of their new products to try out, including a bottle of MegaLast Nail Color in Club Havana, a vivid opaque orange which gets great coverage in 2 to 3 coats. (That's two coats shown above.) Orange is yet another hot nail color for the spring/summer season, and once you put it on, you'll know why. It's bright, bold and makes you want to lounge somewhere sunny and drink Mojitos.